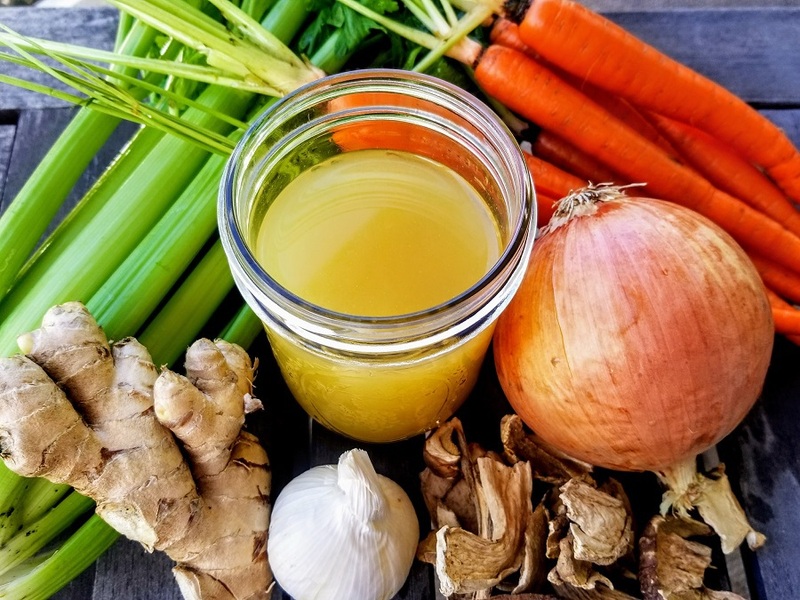 Bone broth, or stock, has become increasingly popular recently for its easily digestible minerals and its detoxification and healing properties. The truth is, bone broth has been a staple around the world practically since the beginning of time! As a base for soups, stews and gravies or just to warm and sip, it is easier than you think to make bone broth a staple in your house too. 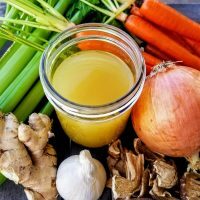 This Crock Pot Bone Broth saves you time and it’s also so much more healthy and flavorful than canned or boxed broths off the shelves. 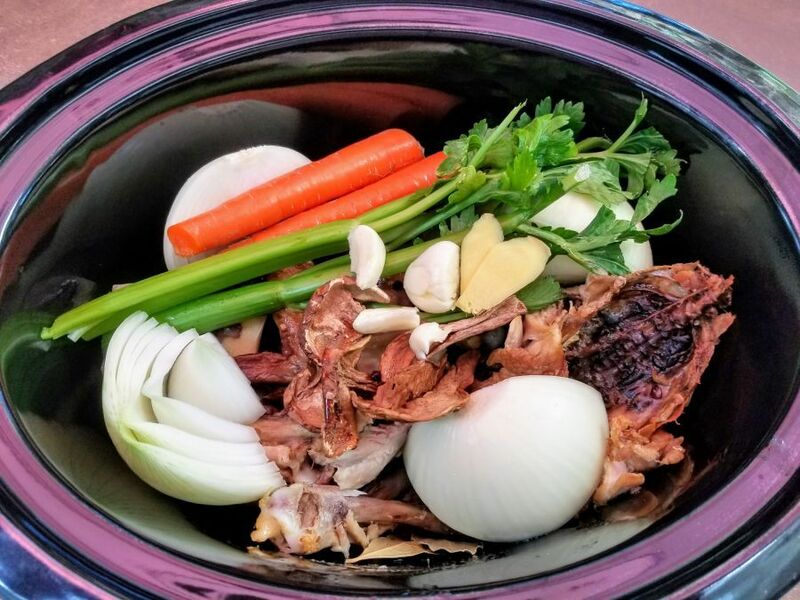 You can prepare this crock pot bone broth in fifteen minutes and let it slow cook. This bone broth recipe also converts to an instant pot bone broth recipe! Yes, traditionally bone broth needs to cook…for a long time…which can make the idea of homemade stock just a busy mom’s daydream. That’s where your Crock Pot comes to the rescue. With this recipe you can make homemade bone broth while you sleep. 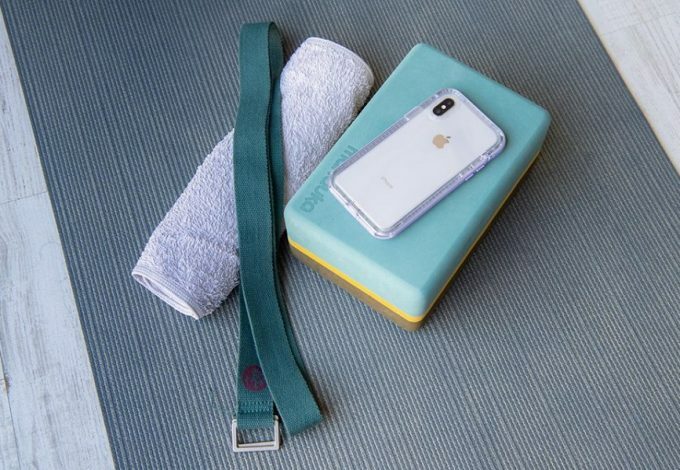 Don’t throw out those bones from last night’s roast chicken dinner. Even if that roast chicken was brought home nice and warm in one of those brown bags, you can make double duty of the leftovers. Beef bones from a roast work well also. You can buy beef marrow bones at most markets. I like to use a mix of beef and chicken for nicely layered flavors. Place the bones you will use on a cooking sheet and roast in the oven at 350 for about 15 minutes. This will help bring out the flavor as they cook in the Crock Pot. While the bones are roasting, clean all vegetables. Peel and cut the onion and ginger. I prefer to leave the greens on the celery stalks. After 15 minutes, use a pair of tongs to transfer the bones to the Crock Pot. Layer all the vegetables, mushrooms, bay leaf and peppercorns on top. Add the peppercorns and Apple Cider Vinegar. Pour 8-10 cups of water over the top. Just enough to cover the bones and vegetables but not to the top of the Crock Pot. Cover and cook on low at least 10 hours and up to 20 hours. After cooking, let the broth cool for an hour. Once cooled off, set a large pot in the sink and using a mesh strainer, slowly ladle or pour the contents of the bone broth through the strainer, into the pot. The bone broth will filter through the strainer. Finally, from the pot, you can use your Crock Pot bone broth immediately or save portions for future use. The broth will keep in an airtight container in the refrigerator for 3 or 4 days. Also, you can also portion your bone broth into freezer bags or freezer safe containers and it will last for a long time. Always be sure to label the containers before you freeze them. 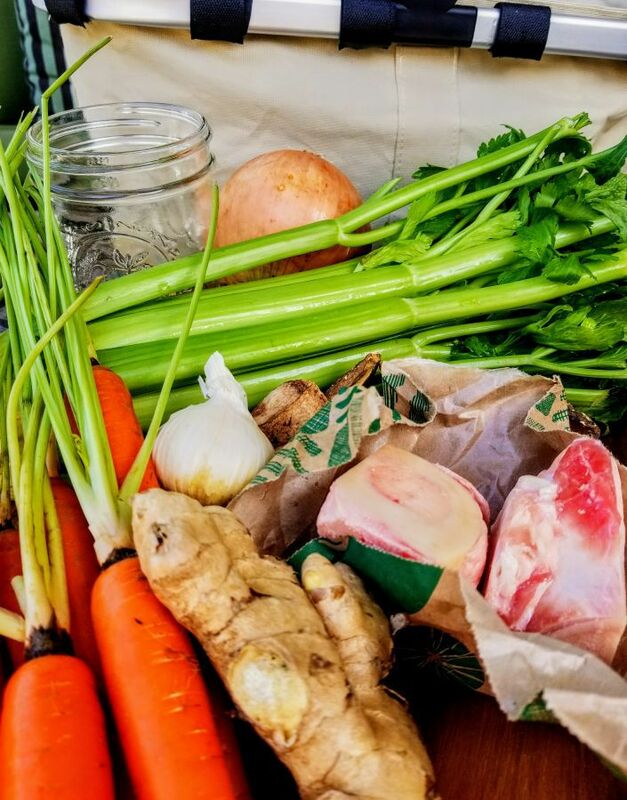 Need your bone broth in a hurry? No problem! We have you covered with a conversion for your instant Pot. Whether you have 10 hours or 10 minutes to prepare, this recipe works for you. 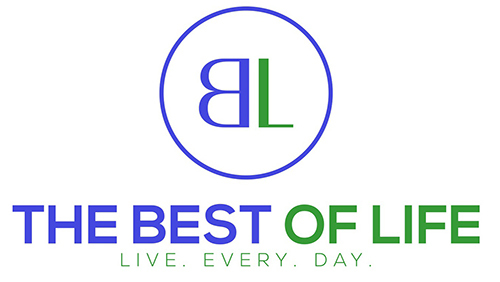 In either case, Crock Pot bone broth or Instant Pot bone broth recipe preparation is quick and simple with great results. Follow all of the directions above for crock pot bone broth recipe preparation. Be sure your Instant Pot is on “Sealed”. Set your Instant Pot on Soup/Stew setting for 30 minutes. Natural Release and let your Instant Pot bone broth recipe sit for 10-15 minutes. Finally, from the pot, you can use your Crock Pot bone broth immediately or save portions for future use. The broth will keep in an airtight container in the refrigerator for 3 or 4 days. Also, you can also portion your bone broth into freezer bags or freezer safe containers and it will last for a long time. Always be sure to label the containers before you freeze them.